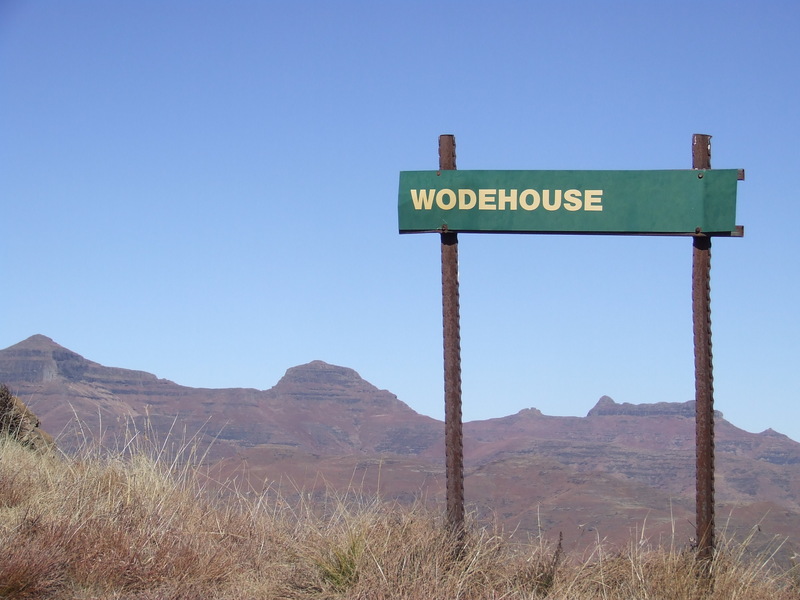 Wodehouse Peak was named after Sir Philip Edmond Wodehouse, the Governer of the Cape Coloney in the 19th century. Wodehouse’s negotiations ended the conflict and the Boers and the Basotho the beacon on Wodehouse Peak (2 438 m) marked the original border between the Orange Free State and Basotholand. The 11km circular trail is perhaps the best, most accessible route in Golden Gate for more ambitious hikers because it has a clearly marked path and also includes both the Brandwag Buttress and Mushroom Rock routes. A brisk pace will have you finish the hike in 4 hours although this time may vary based on you fitness levels and the time taken to view the scenery. 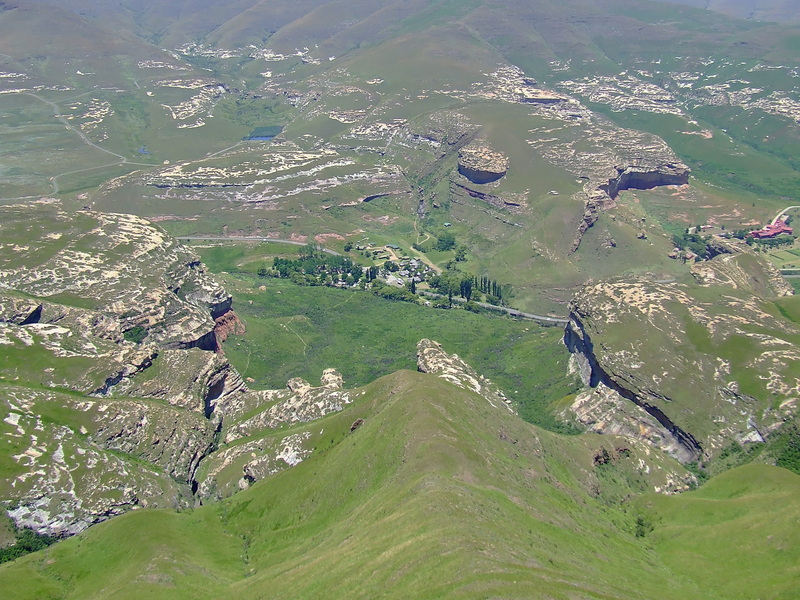 From the ridge towards Wodehouse Peak, one has a spectacular view of the Glen Reenen Rest Camp in the valley below. It is also breathtaking to see the sandstone tops of Mushroom Rock, Brandwag Buttress, Boskloof and Echo Ravine almost 500 m below. Wodehouse Peak is an excellent stepping stone for the hiker who wants a bit more adventure than the short hour-walks can offer but doesn’t want to tackle the longer, more intimidating Ribbok Trail. Thanx for your site. Myself and my two kids (9 & 11 years) completed the wodehouse route today. – the uphills were exhausting and the downhills tough on knees and feet – but it was all worth the magnificent views! Oh how I wish we had seen your site earlier BEFORE we attempted this trail. We’re at Golden Gate only for a short two day stay and we decided to tackle the circular route (we are going to the Otter trail in 2016 after all, so why not?) and besides the most amazing scenery the trail was a bit of a disaster to us 🙈 Firstly we mad the mistake mistake of misjudging the altitudes of this trail and also the level – the map didn’t describe the difficulty – so we onltly took 1liter water to share as a couple. NEVER AGAIN – always take loads of water rule #1. Then secondly we were confused by the trail namings – ee almost turned back because the path tho wodehouse split into two which had not been indicated on the map and we found only a sign saying “ribbok”. We decided to stick to the trail and see if it splits again. Luckily we did, we came up to the evergrowing peaks of Golden Gate National Park. Then when we finally arrived at widehouse peak we found a sign that said “end of Wodehouse”. WHAT!! We had seen a funny untamed route descending from the wodehouse view a bit earlier (or was it the peak just before that?) and took that we had to make the turn for the loop down there ; so up and down the peaks we go again to take this funny pourly indicated route down the hill. Halfway down we realise this is some really crappy road and probably only used gy the horses or wild when they feel like coming down the hill – it was basically doing tome bushwacking. We didnt realise that Wodehouse comtinued deeper into the mountains with the returnside of the loop only after the peak. Unfortunately, besides the view this had proved to be a not-so-nice experience for us, so rule #2 read up on the trail you plan to do – even if it is a short one (but longer than an hour.) I really wish I had, and I wish that the park will refer others to your very detailed descriptions of the trails. I’ll also be posting on my blog about our experience soon so keep an eye out! Thanks for the comment, Corne. It is unfortunate that your experience wasn’t what it should’ve been. The management of Golden Gate could really make more of an effort to design proper maps (I assume you only had the lame black & white photocopied map they hand out at the camp offices?). You’re also right that the sign “end of Wodehouse” is actually not even at Wodehouse Peak, which I always assumed was the highest point of the route (where they erected the trig-beacon). But I must confess that the route I have on this site is possibly an unofficial loop. The pathway down the ravine towards Mushroom Rock does not have a well-maintained path, but it is ‘walkable’ (i.e. you don’t need climbing experience or nerves of steel to do it). I agree 100% with you first bit of advice. Always take as much water as you can carry. On long walks during hot days it is very easy to drink 5-6 litres per person. I’ll visit you website and keep an eye out for your report back on your trip! Hi Stephanie, unfortunately since it is a national park, no dogs are allowed.